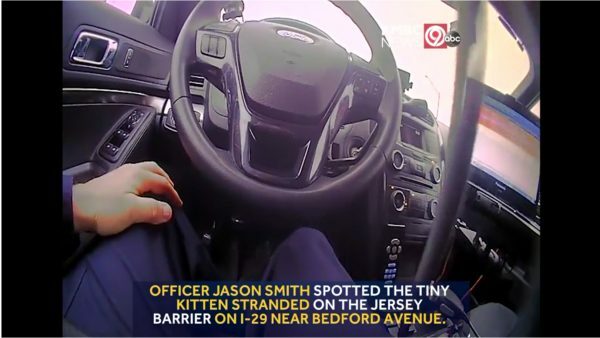 Officer Jason Smith of Kansas City, Missouri was driving along the I-29 when he spotted a tiny kitten sitting on the median between the north and southbound lanes. He had no idea how it had gotten there, but he knew it needed help. After notifying dispatch and requesting help with traffic control, he scooped up the loudly meowing kitten and brought her to safety. His body cam footage shows her purring contentedly and busily exploring his patrol car. At one point, she even accidentally turns on the siren! Officer Smith and his family ended up adopting the kitten, who is now named Bella. She is not allowed to play on highways anymore. For Mina Gerges, high school in Toronto was not easy. He was born in Egypt and lived for a time in Abu Dhabi before his family emigrated to Canada. Not only was he a foreigner, he was coming to terms with his sexuality. He struggled to accept himself while confronted with anti-gay sentiment within his culture and homophobic bullying at school. Says Gerges,”Some of the things this group of guys would do were make fun of my feminine actions, use anti-gay slurs at me, openly gossip about my sexuality, and mimic my voice when answering questions in class.” He has managed to survive and thrive, and now uses his voice as a LGBT advocate, but he was shocked to receive a message of apology from one of his bullies shortly before the end of 2018. He decided to reply. I messaged him back and asked him why he thought about it 8 years later and he said he felt really bad about it for a while, should’ve been kinder instead, and wished he’d done it sooner. We love growth! The two had a healing conversation that serves as a reminder of the power of a sincere apology. It could happen to anyone. Rachel Schoonover of Elmira, NY was washing dishes at her kitchen sink when she accidentally shattered a wine glass. Unfortunately for her, one of the jagged edges caught an artery and blood began spraying everywhere. She called 911. First on the scene were the Elmira Fire Department, who soon got the bleeding under control. Schoonover was taken to the hospital, but her kitchen was a bloody mess and there was no one to watch her young son. The fire fighters, however, were on the case and stayed at the home until someone could be found to help. When Schoonover returned home later that evening, she was surprised and delighted to find that the mess had been mostly tidied, and the thoughtful fire fighters had left her a kind note. Talk about going above and beyond the call of duty! This is a story from December 2018 that is a timeless demonstration of generosity of spirit. At the school where Rachel Uretsky-Pratt of Kennewick, Washington, 100% of the students, who are from low income families, are on meal assistance. They receive free lunch and breakfast. One student, who wanted to give her teacher a gift but could not afford to buy one, got creative. Uresky-Pratt posted about the sweet gift she received: “Today I received some chocolates, sweet handmade notes, some jewelry, but these Lucky Charm marshmallows stood out to me the most.” She was moved by the thoughtfulness this child who had carefully picked the marshmallows from the breakfast cereal she’d gotten from school and saved them to give to her teacher. The picture she posted went viral, and best of all, the attention to the story led to much needed donations for the school (see photo caption for details).